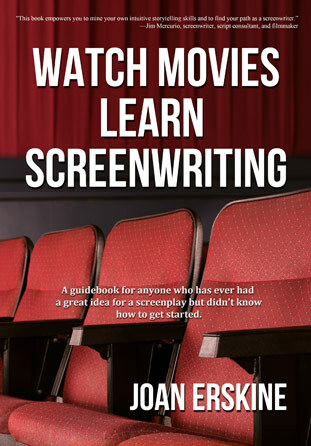 Watch Movies, Learn Screenwriting uses eight award-winning films to show you how writers create great screenplays and how you can, too. From the start, you’ll be working on your own screenplay! The Guidebook (Part I) explains movie basics such as theme, characters and dialogue while The Workbook (Part II) helps you come up with your idea, your characters and a plan for what happens in your story. Next, the Essential Moments Screenplay Outline (Part III) shows how the screenwriters plotted these terrific films by creating specific types of events at key moments and also includes space for you to write what will happen in your story at these moments. Finally, you’ll begin writing your actual screenplay on the Screenwriter’s Initial Draft Paper (Part IV) — thirty-two specially graphed pages that guide you to write your story in film industry approved, screenplay format. The book’s conversational style flows like two movie lovers discussing a film over coffee. Instead of a stuffy text written by a guru prescribing his or her own preset formula, this book empowers you to mine your own intuitive storytelling skills to find your path as a screenwriter.